- for more detail please follow the links. - for latest detail please follow this link. If you have a prayer request please complete the contact form with as much detail as you can and people will use it as part of their prayer times. We really do believe God answers our prayers - please follow this link for some inspiring stories. Community Projects - we are happy to tackle small gardening and DIY projects for pople who need some help - if that's you (or someone you know) - please fill in the contact form, and we will get back to you. 2 miles from Junction1 of the M6 and within a 15 minute bus ride from Rugby Station. 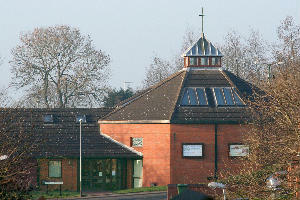 Free car parking is available behind the church. There is no dedicated cycle park, but space to lock bikes is available. There are no dedicated disabled car parking spaces, but access to the church is wheelchair friendly on good pavements with lowered areas. If you feel this is still an issue please call the church in advance of your visit and suitable parking will be reserved. Once inside the church you have full wheelchair access to all areas and dedicated wash room facilities.The building is equipped with a hearing loop. Click here for full details of the church calendar bookings. The privacy statement for Christ Church can be found here.